RARELY IN MOTORING history has the introduction of a new model caused quite such a sensation as the first appearance in 1948 of the Jaguar XK-120. Until that day the sports car had tended to be a harsh, uncomfortable, noisy, and usually cycle-fendered machine which achieved its ends more from its starkness and rigidity than from any particular subtleties of engineering. The new Jaguar changed all that because it offered flexibility, a supple suspension, stylish bodywork, and comfort coupled with a vast performance. This hit the purists where it hurt most, because it blew them all off. With all that power and speed on tap, it was natural that Jaguar should turn to racing as a means of promoting its products and so, from the XK-120, came the competition XK-120C in 1951. The model was popularly called the C-type, not the XK-120C, and this usage led to the adoption of D-type and E-type for later Jaguar models. Our salon car is a fine example of the C-type. Owned by Chuck Davies of Los Altos, Calif., it has been restored to perfection and could not be bettered. Although the C-types were introduced originally for Le Man's in 1951, Davies' car did not leave the factory until late in 1952. It was one of a number of production models built for sale to private owners and in its earlier days it was raced by Lou Brero of Arcata, Calif. Records show that in Nov. 1954 Brero drove it into 5th place at March Field behind four Ferraris, but ahead of six other Ferraris including the 4.9 of Jim Kimberly. In the same month Brero won the 6-hr endurance race at Torrey Pines, which was probably the one major victory of the car's racing career. . In common with other C-types, and in fact with all competition machines, the car differs in detail from others of its type due partly to modifications incorporated at the factory in the light of racing experience and partly to modifications carried out by various owners. For instance, Davies' car is equipped with three twin-choke Webers in place of the original two 2-in. SU carburetors, but this is a perfectly legitimate modification because the 1953 Le Mans factory cars were Weber-equipped. So, despite some other more minor changes, the car can be taken as a typical example of the C-type. The C-type was conceived toward the end of 1950. At that time Jaguar (then quite a small organization) was preoccupied with getting the Mark VII sedan into production, so it was not until six months before the 1951 Le. Mans that the design staff, under Bill Heynes, was able to start work. However, their task was made much easier by the fact that the power train and other components of the production XK-120 were so superior that only minor modifications were necessary to make them competitive and reliable for the race. This, combined with the quite remarkable, planned accessibility of all the components, was decidedly a contributing factor to Jaguar's success and particularly when the cars were in private hands. 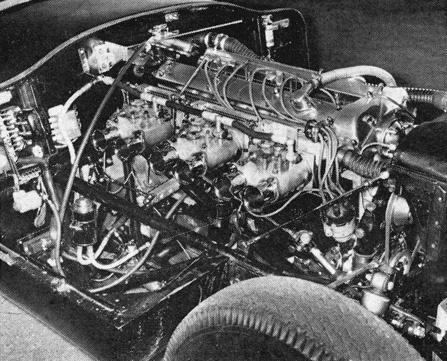 For those who are unfamiliar with the power unit of the original XK-120 of 1948, it was the same engine as Jaguar uses today except that its capacity was 3442 cc and its power output was 160 bhp. However, its design contained. all the basic constituents of the contemporary racing engine, from, its 7-bearing crankshaft to its aluminum head and twin overhead camshafts which combined with a long stroke and flattop pistons to give a classic hemispherical combustion chamber. To achieve the additional 25% was a relatively simple matter and after consultation with Harry Weslake, it was obtained by improving the breathing. This involved the use of larger diameter valves combined with some attention to the ports, high-lift cams, 2-inch SU carburetors drawing from a balance box, a dual exhaust system and a modified advance curve for the distributor. The standard compression ratio of 8: 1 was retained for use with 80 octane fuel, but alternative pistons giving 9:1 were available for use with 85 octane fuel,. The resulting power output was 200 bhp, or 210 bhp with the optional pistons, and the C-type head was later offered as a factory option on special order for the production XK-120s. For the C-type, a lighter flywheel was used mated to a clutch with bigger pressure plate and friction material areas, and a special high-speed damper was installed at the other end of the crankshaft. Little attention was required by the transmission as it had already proved itself to be extremely rugged but an additional set of ratios was made available for it. To accommodate all types of circuits, seven axle ratios were offered ranging from 2.93 to 4.27. 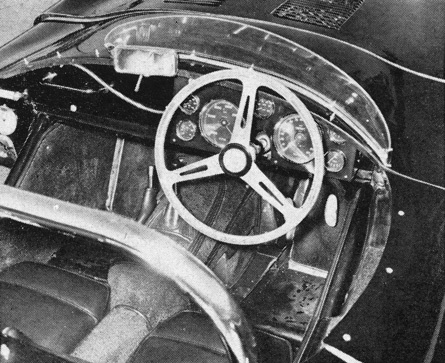 Although the basic XK-120 running gear was used with lit, Ie modification in the C-type, an entirely new frame and body were designed in order to decrease weight and increase rigidity. This was a tubular layout of great torsional strength and it 'was considered to be a very sophisticated structure in its day. Welded up from I-in., 1.5-in. and 2-in. tube, it was triangulated throughout and stiffened by a series of channel section members. In addition, the complete center section comprising the scuttle and instrument panel was welded up and stiffened to form a horseshoe-shaped structure. The frame ended just in front of the rear axle, but an outrigger frame of channel-section extended further back to support the spare wheel, the tail of the body and the 48-gal fuel tank. To surround the whole, a straightforward but efficient body was designed which is as pleasing in its simplicity today as it was in 1951. An important feature of the body is that the complete front hinged forward to give almost unlimited access to the engine and the whole tail assembly was made easily removable for attention to the rear axle and suspension. At the time the Jaguar was designed, drivers of competition cars sat on rather than in their vehicles, but the C-type provided a low seating position with good visibility and as much protection from the elements as one can expect from an open car. Unlike the standard XK-120, which reached an all-time low as far as driver comfort ratings are concerned, the C-type fitted everybody with the minimum of adjustment to wheel and seat. Apart from the necessity for maximum driver comfort during long events such as Le Mans, this was an asset because it permitted drivers of different shapes and sizes to be paired together without trouble. The front suspension followed the standard XK-120 pattern, using A-arms and longitudinal torsion bars, but rack and pinion steering was used to lighten and quicken the steering. The conventional mounting of the live rear axle of the XK-120 was discarded in favor of an ingenious but simple system designed to provide optimum wheel adhesion. In fact, the rear axle layout was one of the most interesting features of the C-type, and it was a great asset on slower circuits where the car tended to show up not particularly well. Rear springing was provided by a single transverse torsion bar which was anchored in the center so that, in effect, it provided two separate torsion bars. A single trailing link was attached to each end of the torsion bar,. and the links were attached to the conventional axle casing by hanger brackets. However, the main locating member was an additional single link situated above the axle on the right side and triangulated when seen in plan view so that it provided lateral location. The effect of this arrangement was to provide adhesion similar to that offered by a de Dion system, but without the complications of the universal joints and short splined shafts inherent in a de Dion layout. Under conditions of severe clutch use and hard acceleration, this system prevented the axle from winding up. Instead, the rear part of the car tended to lift up, exerting a corresponding downward force on the road wheels. Another advantage was that the location of the upper single link prevented the transfer of weight from the right to the left rear wheel, resulting in a decrease in wheelspin, and also in an even amount of wheelspin on each side which terminated simultaneously. As anyone knows who was familiar with the production XK-120, its ability to go was not matched by its ability to stop and so it was with the C-type. The same basic braking system was used for both cars and although the C, at 2100 lb dry, was considerably lighter, the resulting advantage in braking was offset by the increased performance. In the early 1950s the disc brake was confined mainly to aircraft and was just starting to come into its own for racing purposes in England. So, although the 1953 factory C-types were equipped with discs, the earlier models had a very conventional Lockheed system with two leading shoes in front and 12-ill:. drums. A self-adjusting system was used in front and worked by means of ratchets, which many XK-120 owners may remember as a mixed blessing and particularly when the mechanism got dirty causing it to take up one side and not the other. Surprisingly the drums were not of the Al Fin type, because this was the era of the vast aluminum-finned brake drum which could easily have been accommodated within the 16-in. wheels of the Jaguar. However, braking on the gearbox was then the accepted method of slowing a car and the robust Jaguar transmission was well suited to the job. On the road the C-type was totally different from the ultra-sensitive competition cars of today and its handling can be compared to such current sports and GT machines as the' first Cobras or the GT Ferraris of a few years ago except that the Jaguar did not have the benefit of today's tires. 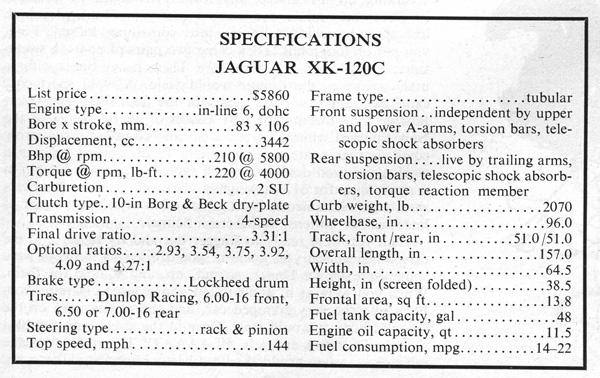 As an example of the comparative insensitivity of the Jaguar, a, contemporary and very discriminating road test of the car noted that it was difficult to tell from the handling whether the tail-mounted 48-gal fuel tank was full' or empty. In keeping with most of the English competition cars of the time, the Jaguar tended to understeer and one drove it through a turn with the tail hanging out. How far the tail hung out depended on the road surface and the skill and courage of the driver, and the whole process was exhilarating for both drivers and spectators alike. The Jaguar was shod with Dunlop Road Racing 650-165, which were similar in appearance to the conventional road tires of the time but were constructed of heavier materials to withstand the rigors of racing. Under strong cornering forces these tires, with their limited contact area and conventional construction, tended to distort and scrub, allowing the driver to slide the car predictably and under control; but the cornering power was dismal by today's standards. Although, if Davies' car were equipped with 1966 competition tires combined with suitable suspension to make the most of the tires while cornering, it would be capable of surprising lap times provided heavy demands were not made on the brakes. the hands of Stirling Moss, and the third, driven by Peter Walker and Peter Whitehead, went on to win at an average of 93.498 mph. During 1951, C-types also placed 1st, 2nd and 4th in the Tourist Trophy at Dundrod and it was decided to run them again in much the same form at Le Mans in 1952. However, as a prelude to Le Mans, one car was sent to the 1952 Mille Miglia for Moss to drive. This was the year Mercedes returned to racing and the story goes that Moss was doing 150 mph along the Ravenna Straight when he was passed rather sharply by a Mercedes. As a result, the decision was made at Jaguar to increase the maximum speed of the cars by improving the aerodynamics rather than by other means. Accordingly, longer and lower noses were fitted, the radiator header tanks were moved back to the fire wall, and the tails were reshaped and lengthened. Unfortunately the cars were inadequately tested in suitable weather conditions and the whole team retired with overheating problems before the race was two hours old. Following the Le Mans fiasco, it was decided to forget fiddling around with the aerodynamics and concentrate on improving acceleration, maximum speed and braking by more positive means in order to knock some vital seconds off the lap times. The major modifications included fitting triple Weber twin-choke carburetors and disc brakes, and lightening the frame by the use of smaller diameter tubing. Although an three modifications undoubtedly contributed, it is probably, the disc brakes that were the deciding factors, not only because they stopped the car but also because the drivers knew they were going to, which had not been the case previously. When Le Mans time came around again, Jaguar was ready and there was no fiasco in 1953. The Tony Rolt/Duncan Hamilton car won at 105.84 mph with the Moss/Walker car 2nd and, just to prove their reliability as a team, the third car driven by Ian Stewart and Peter Whitehead finished 4th. Having won Le Mans in two out of three appearances, the C-type was retired in 1954 in favor of the D-type, which was to win the race in 1955, 1956 and 1957. However, a number of C-types continued to be raced in private hands and they proved to be a very sound investment for the private owner. First of all, the initial investment was about half that of an equivalent Ferrari or Maserati, and the cost of replacement parts was equally reasonable, mainly because they were standard production items. Furthermore, the cost of service and maintenance was reduced to a minimum by the designed accessibility of the whole machine. This feature proved to be a great asset to the private owner engaged in a busy racing season because it enabled him to make full use of the limited time available for maintenance and preparation. Last of all, Jaguar had established itself as a known quantity in racing, spectators wanted to see the cars and therefore' the entrant was in a strong position when bargaining for starting money. When Chuck Davies acquired his C-type, it had been raced to the point of exhaustion. He had previously restored a Jaguar SS 100 so_he was not only experienced in the art of car restoration, but also, and more important, fully aware of the length of time' and the amount of money a complete restoration takes. His first step was to rent a Quonset hut in which to strip the car and layout all its component parts. Everything was then cleaned down to the bare metal by either steam cleaning, sandblasting, or the application of paint remover. Six months had been set aside for the restoration process, but it proved to be barely long enough due to the amount of work that had. to be sent out to specialists for chroming, painting, upholstering, and merely polishing. Detail work included getting a friendly gunsmith to buff the torsion bars, and Davies himself embarked on the formidable task of making up a completely new wiring harness. However by May 1963 the body, with its 13 coats of black lacquer, was in place and the job was complete. The result is impressive to even the most blase of car fanciers, and particularly so when one appreciates that the C-type was one of the first of the specialized sports racing cars as we know them today.